In a 9x13 baking dish, line up the chicken breast. 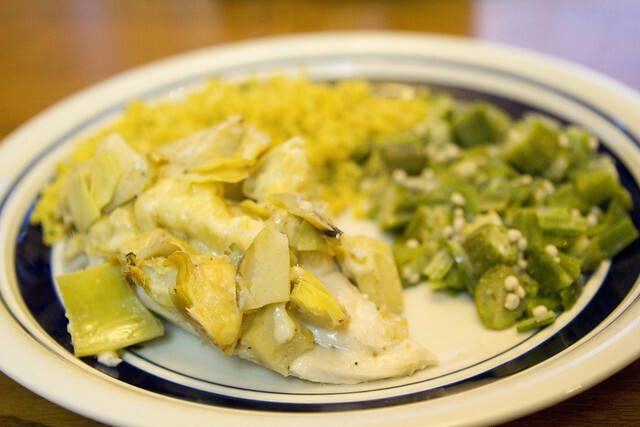 Use the marinade from one of the artichoke heart jars to pour out over the chicken breasts. Chop both jars of artichoke hearts and spread out evenly over all of the chicken. Salt and pepper to taste (I like a lot of salt on mine so I am pretty generous here). Top off the chicken breasts with slices of swiss cheese. I usually lay them like diamonds over the chicken breasts so it covers everything, and normally use about 6 slices. Bake in the oven at 350* for around 30-40 minutes-- until chicken is cooked and cheese is melted. I normally serve with rice of some kind and either okra or broccoli. YUMMM!